Otter Products LLC markets its Rugged Laptop Carrying Case as the ultimate computer tote, with a virtually indestructible polypropylene shell and a design that’s waterproof, crush-proof, pressure sensitive, and lockable. 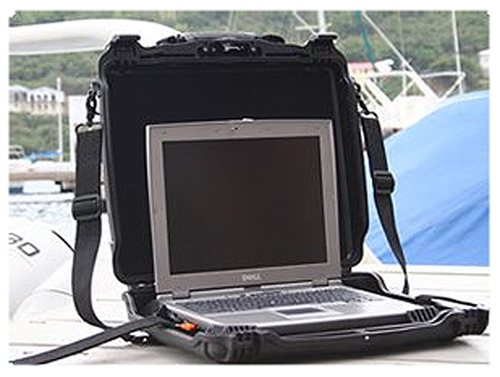 At $170, the case essentially converts a workaday laptop computer into a “ruggedized” model for use in the outdoors, on boats, or at job sites where the elements loom. As a svelte black briefcase, the Rugged Laptop Carrying Case (www.otterbox.com) can swing a James Bond aesthetic, too, making it passable in formal business settings. I travel extensively with my laptop computer, often storing it in a car trunk loaded with gear. The Rugged Laptop Carrying Case, which is strong enough to stand on, provides peace of mind that my computer won’t be smashed. For use in the field — say you’re an archeologist recording data at a dig — the Rugged Laptop Carrying Case is an alternative to something like the Panasonic Toughbook CF-30, which is a laptop made for the outdoors that can cost more than $3,000. Using the included rubber bumpers, the Rugged Laptop Carrying Case allows a range of computer models to fit snug inside its clamshell case. These shock-absorbing bumpers protect the computer if the case is dropped. Dust cannot easily enter the case. Snapped closed, rain can pound the lid without a drop getting through. The case’s external dimensions are about 16.4 × 14.5 × 3.4 inches; internally, it fits computers at a max size of about 14.2 × 11.2 × 1.9 inches. Most laptops with 15-inch screens and smaller, including the widescreen format, will fit inside the Rugged Laptop Carrying Case, according to the company. I use my Rugged Laptop Carrying Case primarily for protection while traveling, taking it out of the case once my destination — often a hotel room — is reached. However, for fieldwork, a laptop can be accessed while it’s in the Otter Products case. Simply pop open the lid and go to work, typing with the clamshell folded up. When complete, close the lid, snap it shut, and you’re good to go, computer in tow, further off into the wild blue.